Investors have been expecting another "Taper Tantrum" when the Fed starts hiking. The term "Taper Tantrum" refers to the surge in US treasury yields (global government bond yields as well), in summer of 2013 when then-Fed Chairman Ben Bernanke put a spotlight on the wind down of Fed asset purchases (tapering off QE). In February of 2014, the Wall Street Journal stated Last Year’s Taper Tantrum May Have Been Taste of the Future. The Journal cited a research paper on Market Tantrums and Monetary Policy. "When investors infer that monetary policy will tighten, the instability seen in summer of 2013 is likely to reappear," warns the report. "Stimulus now is not a free lunch, and it comes with a potential for macroeconomic disruptions when the policy is lifted," the paper said. The paper’s authors are J.P. Morgan Chase economist Michael Feroli, University of Chicago professor Anil Kashyap, New York University’s Kermit Schoenholtz and Hyun Song Shin of Princeton University. Hell of a Payback, But When? I certainly agree that stimulus is no free lunch and there is going to be one hell of a payback for all this stimulus, but when and where? On May 14, 2015, MarketWatch asked Is This a Repeat of the 2013 Taper Tantrum? Let's take a look at a couple charts from the article. That may appear ominous, but who's to say 2015 follows 2013? 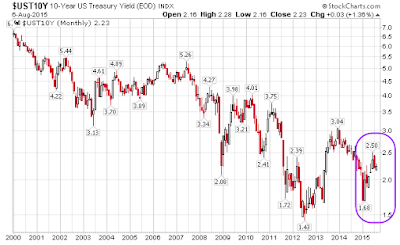 Here is a chart of 10-year treasuries yields as of today. The latest rise looks hugely unconvincing to me. Indeed, there was a far steeper rise in 2012 than the MarketWatch article fails to show! Let's take a look at the second MarketWatch chart. That's interesting, but once again we need to hone in on current action. Here's an up-to-date chart I just produced with data from Fred (Federal Reserve Economic Data). There is absolutely no hint of a taper tantrum recently. Instead, yields have been falling smack in the face of fed hikes, now purportedly coming in September. 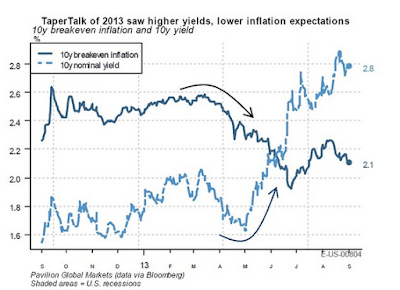 Note the breakeven inflation rate is heading South, even as the Fed is prepared to hike. I can spell what that means in one word: recession. Fed Yap vs. Futures; Bloomberg vs. CME; Eighth-Point Baby Hikes! Friday's Job report may skew the odds, but this is how I see things: Fed Yap vs. Futures; Bloomberg vs. CME; Eighth-Point Baby Hikes! Is the Fed's next tool the eighth-point baby hike, possibly within ranges, but only if the Fed has "Mother Market's" approval, worked out in advance via Fed-Yap? That's my "Mother May I" take a baby-step prediction. The only change I would make, regardless of the jobs report, would be to call it "Market May I" take a baby step. People forget what a "real tantrum" looks like. I happen to have a chart that depicts one. Now, that's one hell of a tantrum. 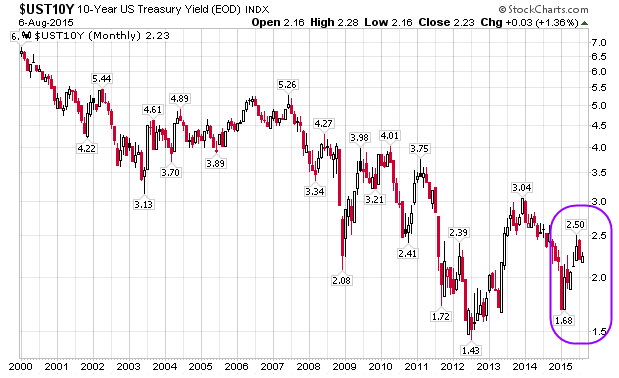 The tantrum was not in US treasuries, but rather in junk bonds. The above chart shows yield on junk bonds as well as the spread between yields on junk bonds vs. similar duration US treasuries. I did not mark the peak on purpose. Instead I marked a secondary high. Look at the date closely. 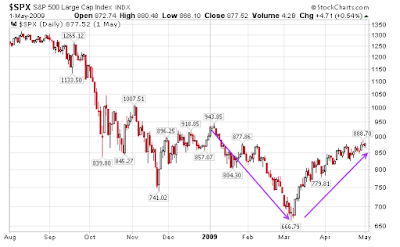 The S&P 500 bottomed at 666 on March 9, 2009, precisely the date of the final surge in junk bond yields. Fancy that. What else was in play? Please check out the history of Mark-to-Market Accounting. October 10, 2008: The Financial Accounting Standards Board (FASB) issued further guidance to provide an example of how to estimate fair value in cases where the market for that asset is not active at a reporting date. December 30, 2008: The SEC issued its report under Sec. 133 and decided not to suspend mark-to-market accounting. March 16, 2009: FASB proposed allowing companies to use more leeway in valuing their assets under "mark-to-market" accounting. April 2, 2009: After a 15-day public comment period and a contentious testimony before the U.S. House Financial Services subcommittee, FASB eased the mark-to-market rules through the release of three FASB Staff Positions (FSPs). The final stock market plunge from January-March 2009 occurred when the FASB "decided not to suspend mark-to-market accounting". The recovery began just before mark-to-fantasy resumed. I believe the two are related. Viable corporations could not get funding. They were priced as if they might go bankrupt. The problem was not (and still is not) mark-to-market accounting. Leverage is the problem. Let's hone in on subsequent details. Interestingly, the current focus is on the relatively minor "taper tantrum" in 2013, not the enormous junk bond revolt in 2008 or the followup revolt in October of 2011. 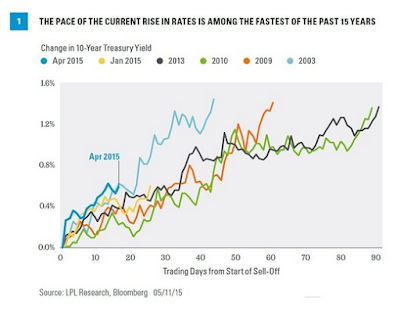 Note the "orderly so far" rise in junk bond yields. Banks were (and still are) leveraged to the hilt. And that remains a problem. In addition, the corporate bond bubble is enormous. Bernanke and the FASB revived the junk bond market in 2009 with mark-to-fantasy, a flood of QE, and zero percent interest rates. In the ensuing years, corporations borrowed heavily, not to invest, but rather to buy back their own shares at absurd prices. And people expect no payback! Problems will resurface as interest rates rise, and especially when the junk bond market starts worrying about ability of corporations to pay back speculative loans, not at falling interest rates, but at rising rates, even if only baby-step hikes. Investors eying treasuries for signs of a tantrum are likely looking in the wrong place. Junk is where the action is. Finally, treasuries may easily be the beneficiary of the next tantrum, just as they were in 2007, in stark contrast to what most "tantrum watchers" expect.